The News-Herald Blogs: Tuned in to Pop Culture: New Tru TV series: Vindication for Wile E. Coyote, Acme Co.
New Tru TV series: Vindication for Wile E. Coyote, Acme Co. But fear not! I have found an oasis in this desert wasteland of summer TV viewing. 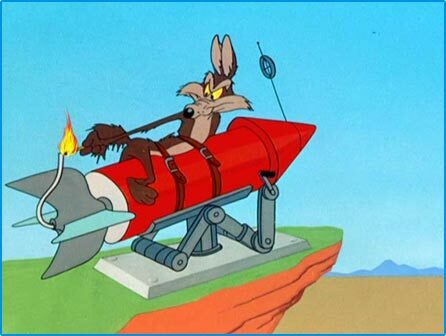 That’s right folks, a group of students and researchers at New Mexico Tech's Energetic Materials Research and Testing Center are breaking down film of Wile E.’s debacles and attempting build successful versions of his traps, gadgets and killing machines. Among the contraptions the group has tried so far: a model airplane carrying a bomb, rocket-powered roller skates, and a swinging spear attack. For aficionados of the Wile E. Coyote-Roadrunner cartoons of yesteryear, this is a terrific trip down memory lane. For those interested in physics and science with a little technology thrown in, it’s a lighthearted hour. For the Acme Company, it’s a boon for business. OK, Acme isn’t real, but if it was, I’m sure they’d see profits beating Wall Street expectations thanks to the exposure on national TV, with its products being shown actually working for once. New episodes air at 10 p.m. Saturdays, with reruns throughout the week.